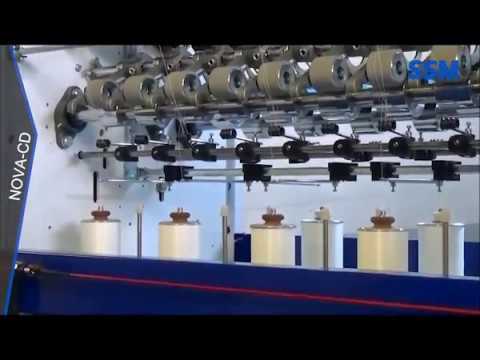 Machines for parallel winding of spun and filament yarns on flanged bobbins for the production of conventional covering and filament twisting preparation packages. 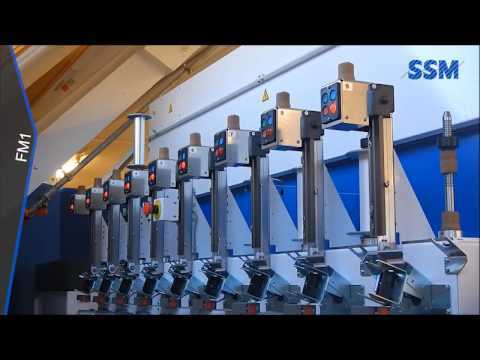 With the NOVA-CS, SSM GIUDICI is offering a conventional single covering machine for high quality elastic covered yarns ranging from fine to medium final counts. Synthetic yarn composed of one or more filaments that run the whole length of the yarn. Yarns of one filament are referred to as mono-filament; yarns of several filaments as multi-filament. Textile yarn spun and twisted from staple length fiber, either natural or synthetic. Natural fibre from the cotton plant which is spun into fine yarn. Animal fibre; most commonly used to mean the yarn spun from the sheep. Also known as Polyester POY, it is the primary form of Polyester yarn. POY is the first form of yarn made by spinning Polyester PET Chips. Mainly used for texturizing. Obtained by further spinning, stretching of synthetic filament. The fiber has been fully stretched. FDY can be used directly in the textile process. Made from Polyester POY by simultaneously twisting & drawing. DTY yarn is mainly used in weaving and knitting. Synthetic fiber made from a polymer (Polyacrylonitrile, also known as Creslan61). PAN belongs to the family of acrylic resins. It is a hard, rigid thermoplastic material that is resistant to most solvents & chemicals, slow to burn and of low permeability to gases. Polypropylene is a thermoplastic polymer used in a wide variety of applications including packaging and labeling, textiles (e.g., ropes, thermal underwear and carpets), stationery, plastic parts and reusable containers of various types, laboratory equipment, loudspeakers, automotive components, and polymer banknotes. An addition polymer made from the monomer propylene, it is rugged and unusually resistant to many chemical solvents, bases and acids. Also known as Nylon. PA consists of chemical fibres and are obtained from synthetic polymers. Polyamid is very resistant and tear proof as well as elastic, stretchable and takes just a little moisture up. In addition it is extensively crease-resistant and drip-dry. PBT is similar to other thermoplasic polyesters. Compared to PET, PBT has a slightly lower strenth and rigidity, but a better impact resistance. The yarn has a natural stretch and can be incorporated into sports wear (most common found in swimwear). Natural protein fiber composed mainly of fibroin. Silk is produced by several insects, but generally only the silk of moth caterpillars has been used for textile manufacturing. Aramid is the short term for aromatic polyamide. They are fibres, in which the chain molecules are highly oriented along the fibre axis, so the strength of the chemical bond can be exploited. The fibre is heat-resistant and of great strength. Aramid is used in materials for bulletproof vests and radial tires. Viscose, formerly known as viscose rayon, is made by treating cellulose with caustic alkali solution and carbon disulphide. It is a soft fibre commonly used in dresses, linings, shirts, shorts, coats, jackets, and other outerwear. 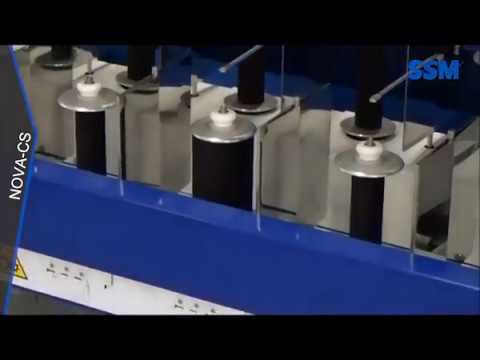 The flexible and innovative concept of the manual FM1 preciflex™ permits the cost efficient preparation of flanged bobbin for the covering and twisting process. During the development process particular attention was given to achieving low energy consumption (even at high winding speeds) as well as superior packages for improved unwinding performance during covering. 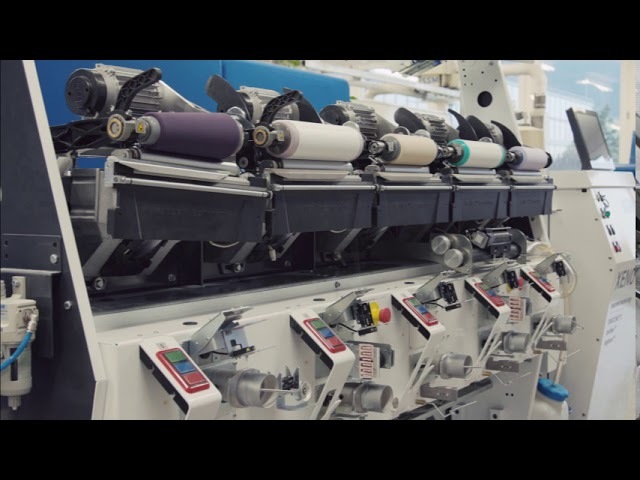 Higher machine efficiency, lower costs and improved yarn quality are the benefits. but also an optional "automatic traverse correction system" for the elimination of any operator interventions due to varying bobbin dimensions; enhanced unwinding performance and reduced labour dependency are the result. Elastane or Spandex is a polyurethane-polyurea copolymer. This synthetic fibre can be stretched from four to seven times their length, reverting to their original length when the tension is relaxed. Used for all areas where a high degree of permanent elasticity is required: hosiery, underwear, sportswear, and in woven and knitted fabrics. Standard spindle length 5.5 ˝, shaft 25 mm or 32 mm, spool holder 30 mm or 48.4 mm. Optional with adapter for 6.5 ˝ spool. Please enter your e-mail and click "send". We will send you the download link directly to your e-mail address. Salutation This field is mandatory! Lastname This field is mandatory! Company This field is mandatory! Country This field is mandatory! By submitting any personal data to us, you agree with the use by SSM of such data in accordance with our Privacy Statement! Please click on the left checkbox to acknowledge.